I admit, I’m not a flop and drop kind of traveller, I like to ride the road less travelled and I go out of my way to avoid tourist traps, I don’t mind a long bus ride or a sleepless night to get to the far reaches of this planets most incredible locations and since my kids were big enough to walk, they have been in the back pack coming along with me to some of these locales. So when the opportunity arose, the Amazon Rainforest didn’t even register as a ‘no-go’ zone for the family, especially now that my two young sons are big enough to carry their own backpacks! What I wasn’t expecting, though, is how easy it was. Even now when friends learn of this recent venture of taking the boys to the Amazon, the trend is for them to assume we, as a family, have been on another of our crazy escapades and give us a bit of a better them than us kind of look, visions of malarial infested backwaters teaming with frenzied piranhas chewing at unsuspecting toes and jaguars following visitor’s scent until that perfect ‘pounce moment’ arises, tends to set the imaginary scene. You certainly won’t find the Amazon listed in your regular top 50 kids holiday destinations, not yet anyway. Yet, as the conversation flows and my recall of our personal experience unfolds, most are amazed to discover I don’t rate it at all on my list of wildest experiences. Well, actually, if you are talking about witnessing pristine wildlife living in harmony in one of the world’s most incredible ecosystems then yes, I admit, it does rate, but in terms of discomfort, hard travelling, dangerous and “what the heck am I doing here” kind of experiences – not at all. 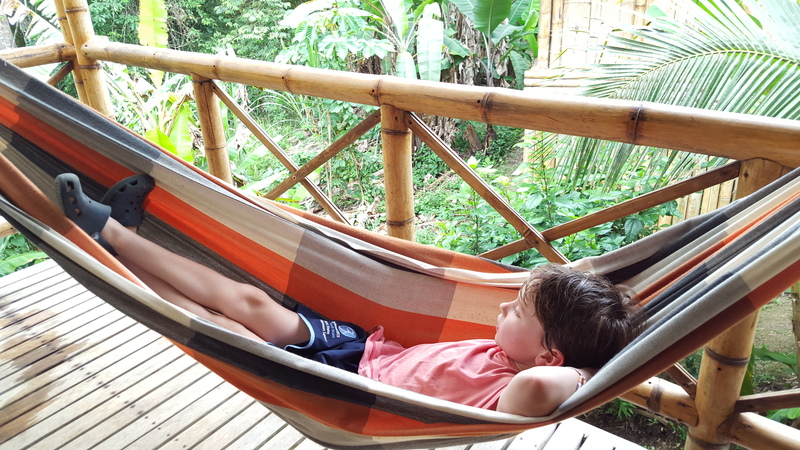 In fact staying at La Selva lodge was up there with one of the most comfortable experiences of my travelling years and I would have to say the best place I have visited with the family to date and I don’t say that lightly, let’s just say we’ve been around! Travelling from the Ecuadorian capital of Quito to the Amazonian hub of Coca takes only 30 minutes by modern plane, but the flight would have to be up there amongst this planets most dramatic and awe inspiring. Nestled high in the Andean mountains surrounded by extinct and active volcanoes, the landscape surrounding the nation’s capital is a juxtaposition to its low land neighbour. 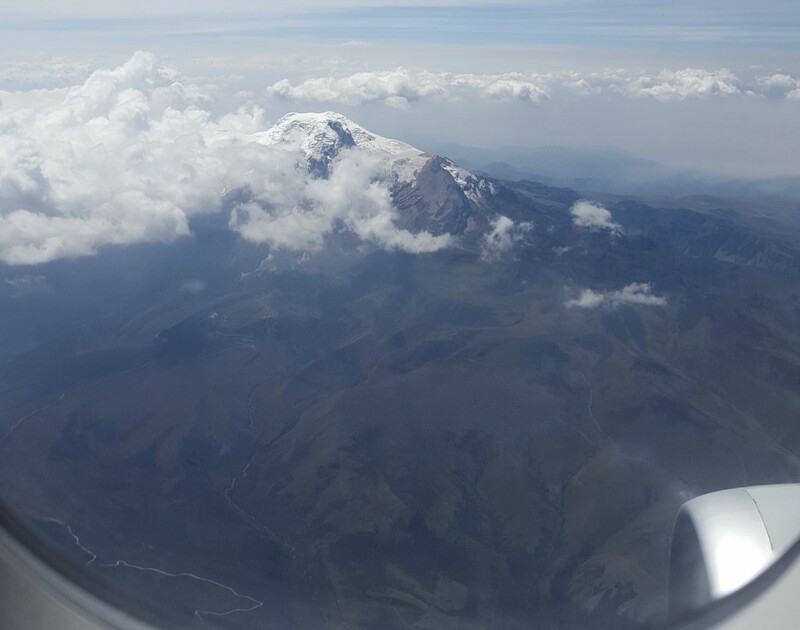 In its jagged reach toward the sky, volcanic activity surrounding Quito continues to drive the Andes up and as such when the plane takes off, passengers are given a bird’s eye view of these stunning pimples on earth’s surface actively going about their business to make the Andes taller. At the time when we flew, Cotapaxi, a regular errupter and standing at over 6000 metres, was in full swing and it was incredible to show this to the boys and discuss the geological phenomenon that was unfolding in front of their eyes, from a nice safe distance, I might admit. No sooner were we “oohing” and “aahing” over this incredible landscape than the earth took a dramatic plunge downward and the Andes gave way to the expanse of the Amazon basin, 5.5 Million km² of it, the largest rainforest on this planet with a contrasting average altitude of only 300m. For as far as the eye can see the only reference is trees, trees and, well, more trees, we were now flying directly over the lungs of our planet, and I was quick to throw a few facts at the boys, conservation being my keyword in hope that exposure to this beauty will stick, that they will truly understand how important nature is, that they will develop a love not an ignorance for the force and fragility of nature. Fact spruiking done, I silently stared in awe, wondering just what has not been uncovered down there, it’s just so big, too big for man to completely mess it up, sure they may be giving it a good shot but man can only destroy its own existence, nature will forever be. 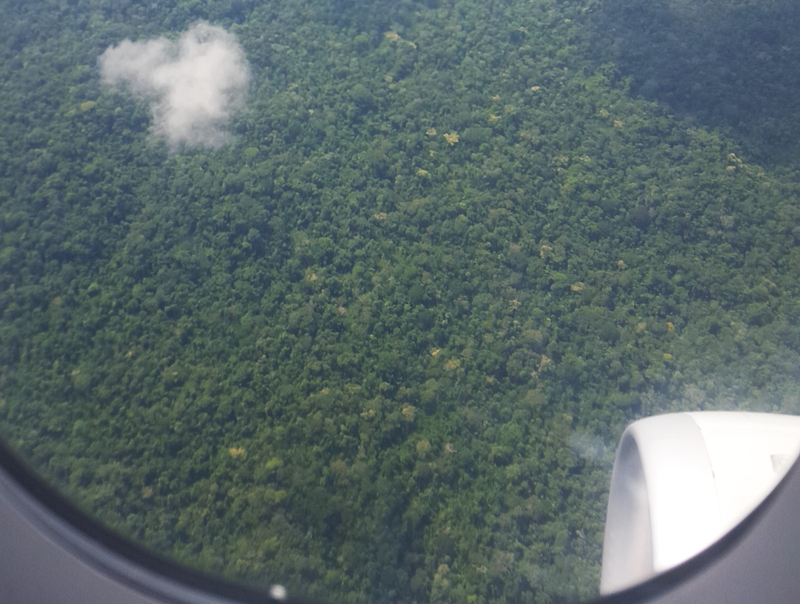 I shook my meandering head back to reality as we soon landed in the small town of Coca. 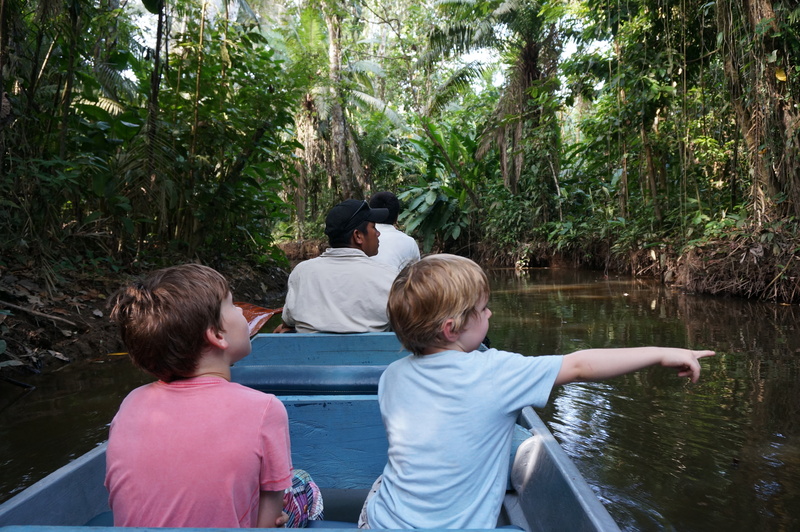 After a swift transfer from the airport into a comfortable river boat we are soon being propelled down the Rio Napo, a major tributary to the Amazon River toward our home for the next three nights. Ice-capped mountains, llamas, condors and volcanoes were thrust into a hasty memory as we were now surrounded by tropical birds, lush vegetation, heat, humidity and colour. It was almost too much to compute, so we sat back in silence and let it all sink in on our two hour cruise toward the lodge. 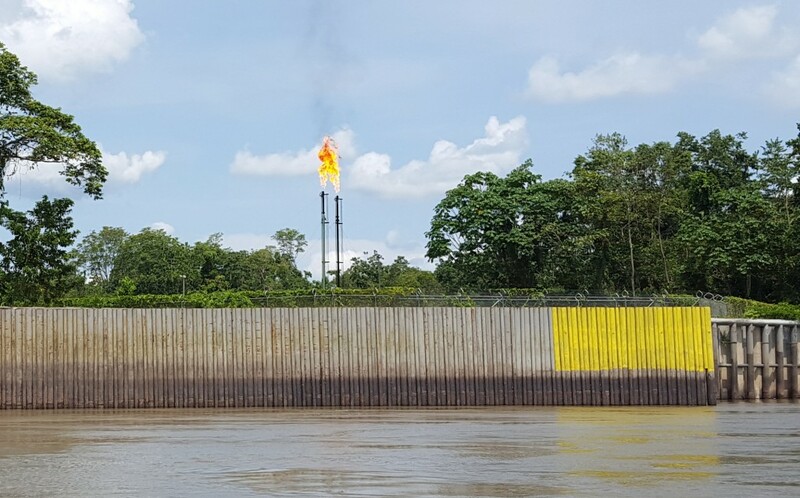 As we made our way deeper into the Amazon, civilized life, for want of a better word, gave way to a more rustic existence, half naked kids ran along the banks of the river waving in puerile delight, local fishermen cruised the eddies in dugout canoes catching dinner for the night and toucans flittered in a welcoming dance as they zigged and zagged their way about their daily business. Just as we were lulled into a false sense of being in the Garden of Eden, oil raised its ugly head and paradise gave way to destruction, where bulldozers have flattened pristine forest and the perpetual flame, from the gasses released in oil mining, tattooed the sky, no children ran here and the toucans give it a wide berth, this was no place for regeneration, this was ‘progress’, and I felt a deep sense of guilt that my lifestyle aids this annihilation. Not to let an educational opportunity go by we pointed out to the kids the effects of fossil fuels on our natural environment and further educate them on the benefits of renewable energy, they are in no position to make environmental choices yet, but one day they will be and perhaps they will remember this moment? Thankfully the Garden of Eden returned very quickly and so did the toucans and children. We were soon escorted off the highway of the Amazon, that being the River Napo, and into a dugout, hand powered, canoe in a small estuary which took us a further 30 minutes into pristine jungle to our eco lodge, La Selva. Here renewable is king, composting is queen and waste is filtered and cleaned. 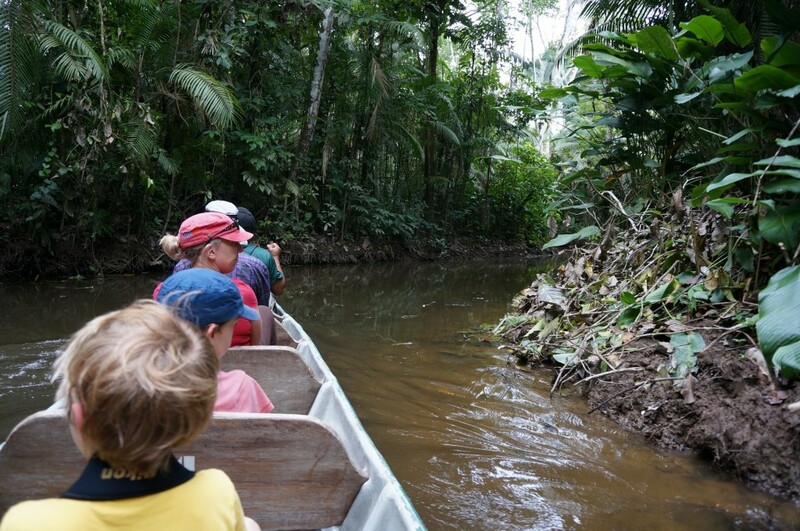 The only sounds we hear is the hum and whoop of jungle animals a-plenty, the gentle lap of the paddle from our canoe and chatter from our travelling party as we marvelled at the giant butterflies, abundant monkeys and exotic sounds from the myriad of birds. After being shrouded by the estuary and overhanging canopy for some time, light finally bursts into centre stage and soon we are gliding across a beautiful lake surrounded by a the most sublime and formidable congregation of tropical vegetation, standing in guard of this piece of paradise. 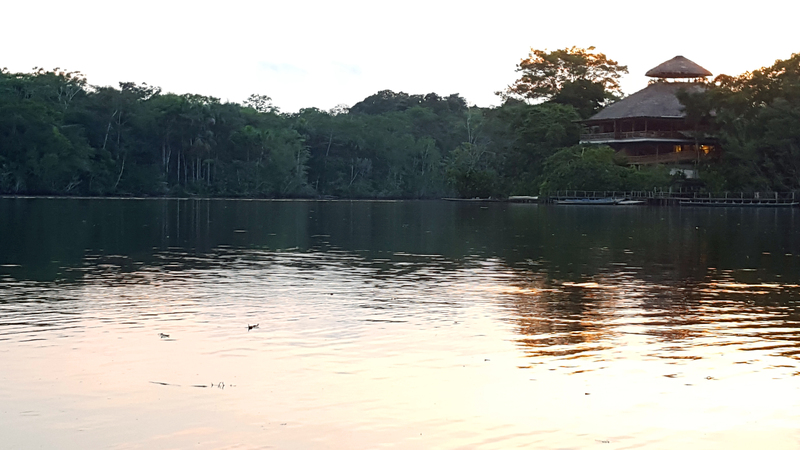 We see kingfishers nipping at the surface catching small fish, the monkeys are swinging through the trees in welcome and those toucans who seem to have followed us all the way finally light on the branches silhouetted high up above and watch us reach our final destination. La Selva, our very comfortable lodge, greets us in an earthly and luxurious charm. The journey has been an incredible education in itself and we let the experience soak in over a quiet cocktail before our afternoon activities begin. 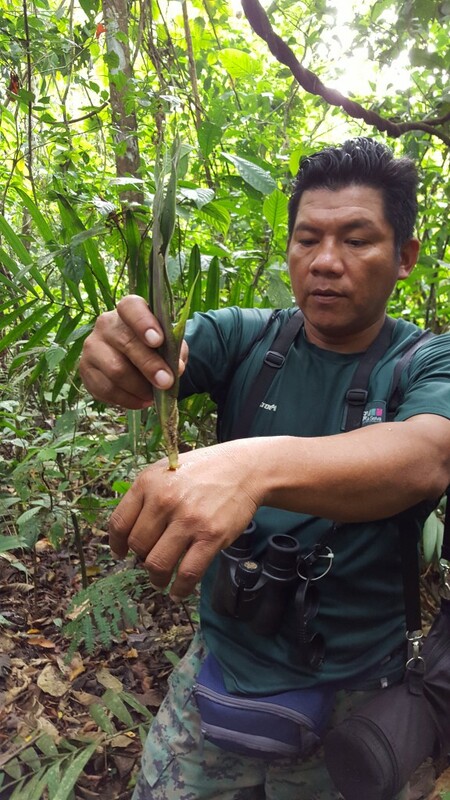 The following three days would be filled with guided visits into the forest and every group staying at La Selva is assigned an experienced naturalist guide, our man of the moment was called Rodrigo, and he is someone we will never forget. 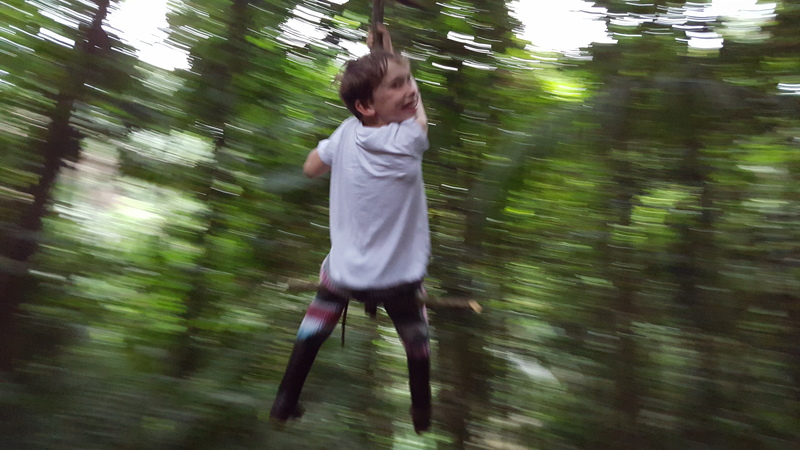 My sons, particularly my eldest Max, are besotted by wildlife and the great outdoors. Aside from our family travels, the other influencers in this space have been media presenters David Attenborough, Steve Backshall, Steve Irwin and Bear Grylls. So you can imagine the boy’s delight when we head into the jungle with their own ‘real life’ version of all of the above. 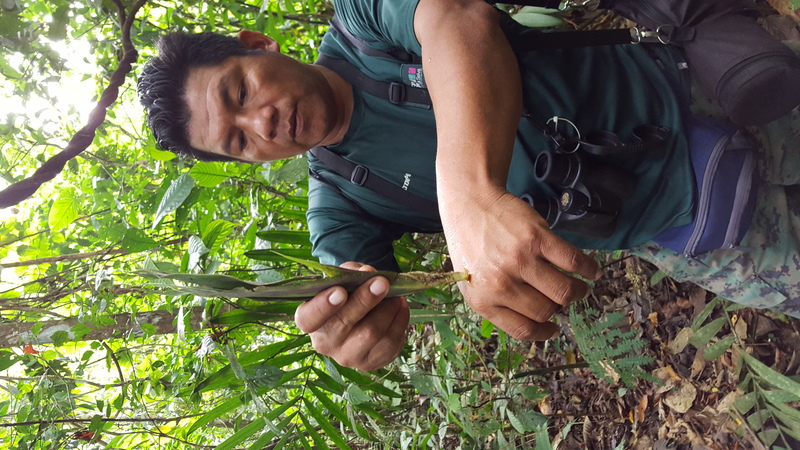 Rodrigo was a gently spoken Amazonian native who was originally employed at the lodge as a kitchen hand, but he worked incredibly hard to learn English so he could use his extensive native knowledge of the area to educate visitors. On our first outing with Rodrigo we would start to see a mutual admiration and respect between my eldest son Max and himself. Max through his intense interest in wildlife, unbeknown to me at the time, had his head filled with random animal facts from all over the world, as we walked through the dense jungle, Rodrigo with his eagle eye would spot the smallest of creatures from a mile away and Max would then rattle off the facts he knew, from the harmlessness of whip scorpions to the painful bite of the bullet ant, to the defense tactics of tarantulas, without consultation they naturally started to work together like a team, Max became his shadow and Rodrigo started impart his deep Amazonian knowledge to both the boys; how to spot animals, where they hid and what the various sounds were, how to be safe and how to make a jungle swing, all as we walked peacefully through the forest. As adults we watched it all unfold and by doing so, we too learnt it all. Every day for the next three days we went out on walks and canoe rides, we visited in the daylight and the dark. 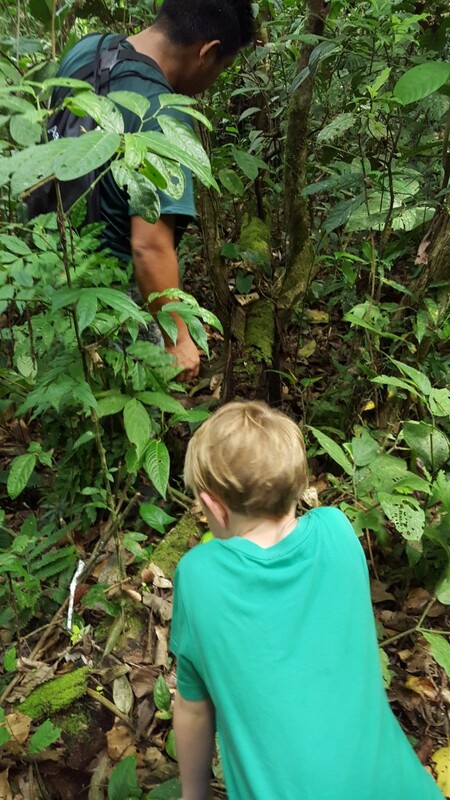 We learnt about the healing qualities of plants, the poisonous effects of dart frogs and the loneliness of sloths. 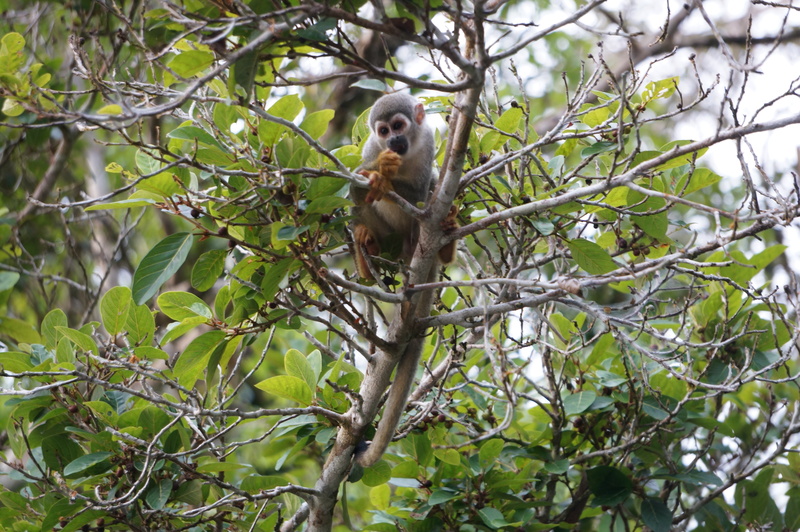 We saw every species of monkey in the area including the biggest and the smallest monkeys in the world and the rarely seen night monkeys. 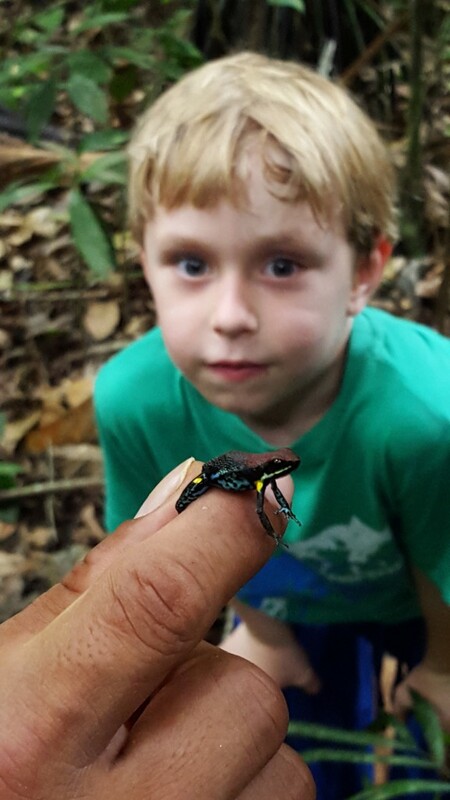 We swung from vines, fished for piranha, visited local villages and hung with the cacophony of birds at the top of the forest canopy. The boys couldn’t get enough of it all, to the point of distraction. Recalling one of the many memorable moments was when Max and Rodrigo, now a well-oiled machine, were in discussions about where we were heading next into the jungle, as they talked Max staring into the water below the canoe exclaimed, “look there’s a fish, what kind is it?” Rodrigo then told him to keep very still and like a flash of lightening his arm plunged into the water and retracted in equal speed with the said fish in his hands! 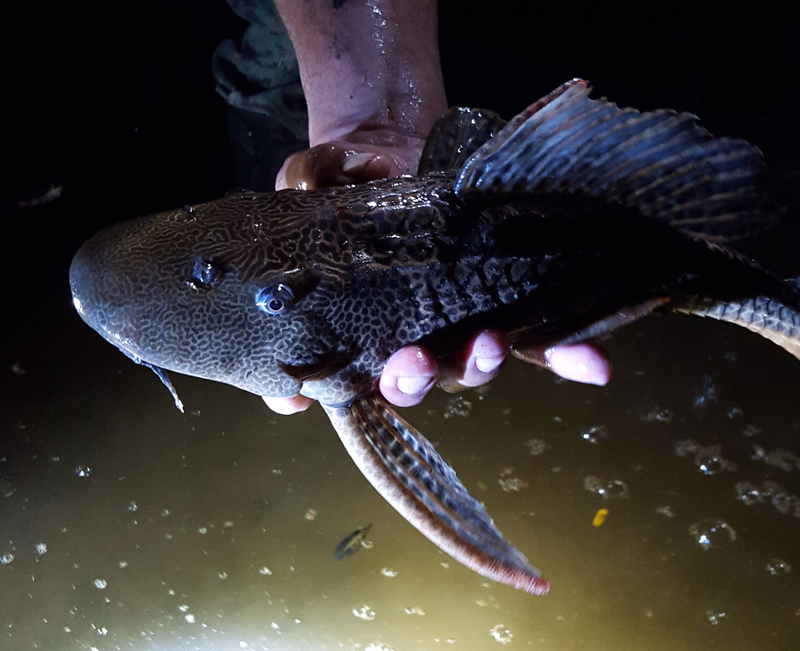 Just like that, bare hand fishing and out came the rustic looking mud sucker. The boy’s eyes were as wide as saucers as they stared in awe and appreciation of Rodrigo’s skills, and I might add I found myself punching the sky and letting out a quick, respectful, woo hoo! It was indeed impressive to watch. In-between all of this we were treated to the most exquisite meals created from local produce in the most exotic setting and incredible comfort, the kids culinary needs were equally catered for, our rooms were spacious, comfortable and airy, from where we would listen to the many noises the night would bring, but there were no mod cons, no television, no air-conditioner, none of this was needed, for it would only lock us away from the greatest spectacle happening right outside our windows. In the end we let the boys go on their own mini-adventure into the jungle with Rodrigo without the grown-ups and it would turn out to be one of the best experiences of their lives, partly because they had Rodrigo all to themselves and partly because they saw the rarely seen tree climbing porcupine and their first ever wild snake, amongst the countless other creatures, it was a little boys dream come true. They talk about this outing frequently and I often think what an incredible memory for two brothers to share for the rest of their lives. 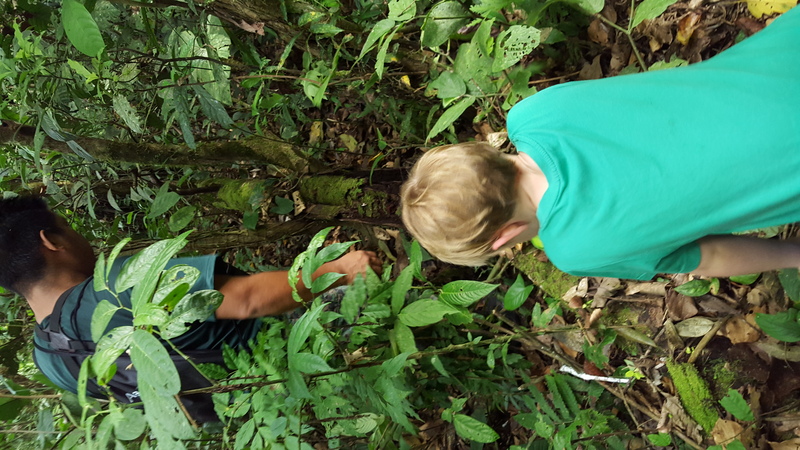 Leaving La Selva was hard, none of us wanted to go, but least of all Max, he exclaimed, “I wish time could stand still, I just don’t want to leave. “ I could tell at that moment he had connected deeply to this part of our planet, and I wonder where that connection will lead, as you can imagine they both talk of returning. With heavy hearts, on day four, we headed back to the Rio Napo and made our way back to Coca, we once again passed the oil well and my thoughts, again, drifted to renewable energy and the advances being made in this space, about the comfort we had just experienced under its power and thought, with a little glimmer of hope that should the boys head out this way again as adults, maybe, just maybe, that will oil well will be nothing more than a relic and a reminder of the destructive desires of man, and how nature won. 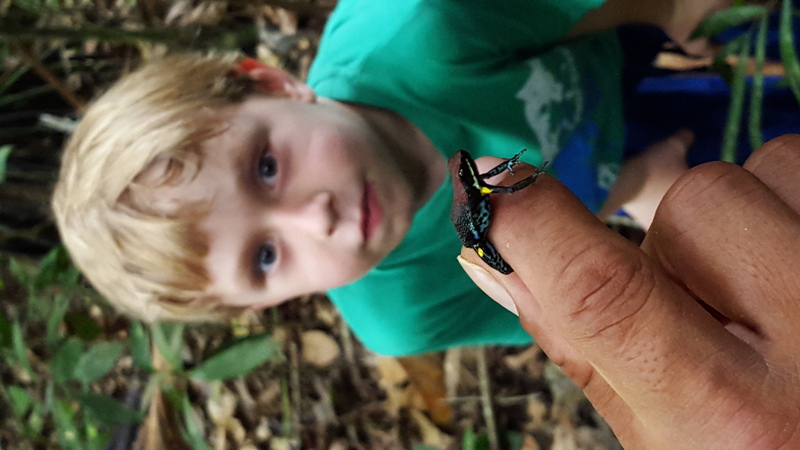 With the next generation better educated and connected to nature, one can but hope, and where better to educate them than in the lungs of our great planet, the Amazon Rainforest. What were the mosquitos like? At the time when we went, early November, there were very few mosquitoes, we have had worse incidents sitting on our back deck at home in Sydney. We took prophylactics but the incidences of malaria in the area of La Selva lodge are very few and far between, most locals claim it does not exist in this area, though we erred on the side of caution just in case. We had no health issues what so ever. You talk about creepy crawlies a lot – weren’t they dangerous? Only if you touch them and even then it depends on how you touch them, any creature on this earth is only a threat if you threaten it. Visiting the area with such an experienced and knowledgeable guide ensured not only safety for the guests but, importantly, safety for the wildlife. What was the plane like, was it old and rattly? Not at all, it was it a very modern plane, the same as domestic planes found in developed countries. In fact Quito Airport is very new, incredibly modern, uncluttered and comfortable. 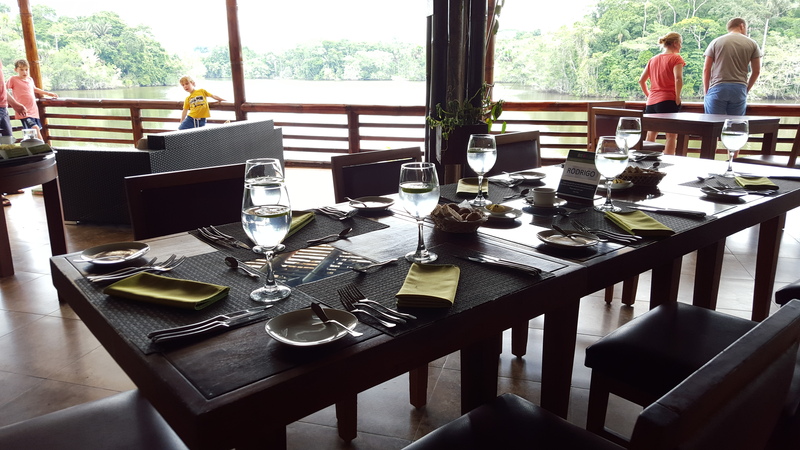 Are you completely disconnected from the outside world at La Selva? Unfortunately not, digital detox is voluntary, WIFI is accessible at La Selva and it works quite well, location considering. If you are considering travelling to South America with the family and have more questions, feel free to drop the gang at Chimu a line. Or check out the family friendly travel options here. 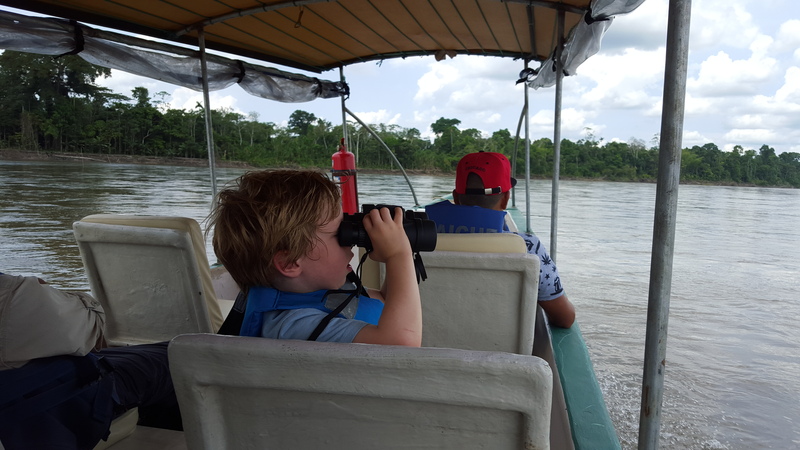 Among the travelling families within the company they have covered: Patagonia, Iguazu, the Pantanal, Machu Picchu, Cusco, the Sacred Valley, the Peruvian and Ecuadorian Amazon, the Galapagos and roads to travel to get there, all with their precious cargo, their kids. From what its like to have kids at altitude to dealing with fussy eaters in South America, they have most the answers covered.